As a motorcycle rider, you are especially vulnerable to serious injury in a traffic accident. Other drivers have a responsibility to watch out for motorcycles and respect their right to be on the road. When a driver fails in their duty to keep a motorcyclist safe, they can be held financially responsible for their negligence. You deserve compensation for your medical bills, lost wages, pain and suffering, and other damages. Let the motorcycle accident attorneys of Lawrence & Associates fight to get you and your family the money you deserve. The award-winning motorcycle accident attorneys at Lawrence & Associates are experienced personal injury advocates. We work non-stop to get our clients the compensation they deserve and need to recover from their injuries. To learn more about how we can help you and your family after a motorcycle accident, contact us today at (513) 351-5997. Do I Really Need a Motorcycle Accident Attorney? If you’ve been seriously injured in a motorcycle accident, you may be facing months, even years, of difficult recovery. You may be out of work for that long, and worried how you’ll provide for your family and pay your medical bills. Do you also want to add the burden of fighting against insurance companies and lawyers to reimburse you for your losses? An experienced motorcycle attorney will take on the burden of dealing with insurance companies and lawyers to get you the compensation you rightly deserve. That way, you can focus on your family and your recovery. A motorcycle accident attorney has the knowledge and experience to evaluate your case. An attorney will know how to demonstrate to insurance agents that you were not responsible for the accident. They will document your past expenses and calculate your future damages so that you do not miss out on any needed compensation. A motorcycle attorney will also work with your insurer to make sure they rightly pay any PIP coverage under your policy, and if necessary, also pay out uninsured/underinsured motorist coverage. If you have to take your case to court, a motorcycle attorney will vigorously advocate your case to a judge or jury to get a favorable verdict and judgment. With a lawyer’s help, you are likely to recover far more compensation than you would on your own. The motorcycle attorneys of Lawrence & Associates are the experienced, award-winning attorneys you need to tenaciously pursue your case and get the compensation you deserve. 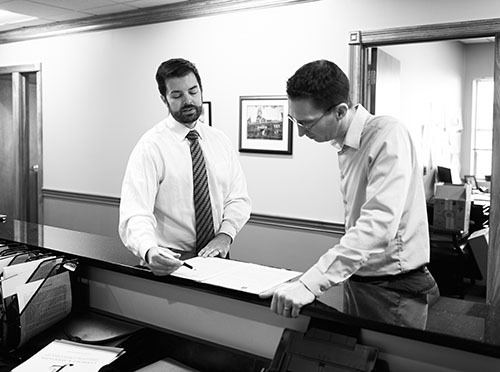 As attorneys, we recognize that we provide a service to our clients. Therefore, we focus on delivering great customer service in handling your case. We do not charge you unless we obtain a recovery for you. We diligently and efficiently handle your case, keeping you advised of each important development in your case. We have recovered millions of dollars for past clients, and we are ready to do the same for you. Single-rider accidents: Motorcycles often get into accidents all by themselves. Sometimes a rider may lose control of their motorcycle due to road conditions, including issues with the construction of the road. In cases where a road owned or maintained by another party is responsible for your accident, you may be able to hold the owner of the road financially responsible for your injuries. Mechanical defects: Motorcycle accidents can be caused by mechanical issues with the motorcycle itself. Even when you properly maintain your motorcycle, you can suffer engine, transmission, brake, or tire issues if the motorcycle was improperly designed or manufactured. When your motorcycle fails you, we can identify the responsible party and bring them to justice. Wrongful death: Motorcycle accidents too often result in the rider’s death. If your loved one was killed in a motorcycle accident through no fault of their own, let us pursue justice for your family. Whatever your injuries or damages from your motorcycle accident, contact the motorcycle attorneys of Lawrence & Associates to start the process of getting compensation. Motorcycle accidents can be overwhelming. Here are the answers to a few frequently asked questions to better help you understand how motorcycle accident claims work. If you have specific questions about a crash, contact our attorneys for help by calling (513) 351-5997 or reach out to us online. Your first concern after a motorcycle accident should be your health and safety, and that of the others involved in your crash. If necessary, head directly to the emergency room, skipping the following steps. You can ask a friend, family member, or lawyer to complete them on your behalf. If you can safely remain at the scene of the accident, contact authorities so that an official accident report can be made. When the officers arrive, note their names and badge numbers. Be honest with the officers, but don't offer any information they don't request. Stick to the facts and don't speculate on the cause of the accident. Similarly, don't make any statements about your injuries. Exchange information with the other drivers involved in the crash. You want to get their names, contact information, insurance information, license plates, and driver's license numbers. You should also gather the contact information from any witnesses. However, beyond gathering this information, do not speak to the others involved in your accident. Just like with the police, you don’t want to make admissions or statements that they can later use to argue that you were at fault for the accident. Take pictures of the accident scene, including injuries, vehicle damage, skid marks, road conditions, and weather conditions. If you are unable to do this, ask a friend or family member to do so for you. The longer you wait, the more likely it is that important evidence will be lost as vehicles are moved from the scene, the area is cleaned up, weather conditions change, and road configurations and traffic controls are altered. Even if you think you weren’t badly hurt in your motorcycle accident, you should still see your primary care provider; they may uncover injuries you were not aware of, and getting treatment quickly may be necessary to prove later on that your injuries were the result of your accident and not some other cause. You should contact a motorcycle attorney as soon as practical. You will likely be offered a settlement from the insurance companies soon after the accident. You should have an attorney review any settlement offers to determine whether it is a fair and reasonable estimation of your past and future damages. The insurance company offered a settlement, should I accept it? Never accept a settlement offer without first having it reviewed by an experienced attorney. The insurance companies know you have suffered serious injuries and will receive medical bills that you may not be able to afford. They know you need cash now and will prey on that need with a low-ball offer. Your attorney will tell you whether a settlement offer represents a fair estimation of both your past and future damages and, if the insurance company is trying to low-ball you, will work to get you the compensation you deserve. When you hire the motorcycle accident attorneys of Lawrence & Associates, we do not charge you unless we obtain a favorable result for you. Even the first consultation is free. If we obtain a settlement or a judgment in your favor, our fees, expenses of the case, and court costs will be paid from your settlement or judgment, never out-of-pocket. Past and future medical expenses: Medical expenses not only include treatment but can also cover durable medical equipment or renovations to your home to accommodate any permanent disabilities you’ve suffered. Past and future lost wages and income: Lost wages damages can also include income you’ll lose out on if you return to work at fewer hours or a lower paying job. Pain and suffering: You may be entitled to compensation for the pain you’ve suffered from your injuries or the loss of quality of your life if you’re unable to participate in activities you did before your accident. Loss of consortium: Depending on factors such as your marital status, your family may be able to claim damages from the loss of your companionship as a result of your accident. The exact amount of compensation you will be eligible for will vary depending on the details of your case. The motorcycle accident attorneys of Lawrence & Associates work diligently to resolve your claim as quickly as possible so that you can get back to your life. If everyone agrees on who is responsible for the accident, a claim may be resolved quickly since the only outstanding question is the amount of damages. However, if the parties contest liability, it may be necessary to take your claim to court. We work as efficiently as the court system allows, but cases can take months to work their way through the court system. According to the National Highway Traffic Safety Administration, per mile traveled, motorcyclists are 30 times more likely than car occupants to die in a crash, and five times more likely to be injured. The Ohio State Highway Patrol reports that there were 157 motorcycle crash fatalities in 2017. In 2016, the Highway Patrol reported that there were 4,235 motorcycle accidents throughout the state. We know that when you’ve been in a motorcycle accident, your focus is on your recovery and your family. You’re worried about when or if you’re going to get back to work, how you’re going to pay your medical bills, and how you’re going to provide for your family. Let the Cincinnati personal injury attorneys of Lawrence & Associates take on the work of investigating your claim and making sure the insurance companies give you the compensation you deserve. Don’t waste another day – contact us today at (513) 351-5997 for a free consultation on your claim.